Thousands of couples who are separated by incarceration have enjoyed the services of National Marriage Encounter Prison Ministry programs through the dedication of more than 50 team couples and clergy going into correctional institutions all over the country. 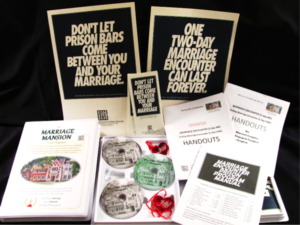 NOW the same Marriage Encounter programs are available to chaplains as complete DVD program packs to help married and even single inmates enrich their lives and that of their families. Over the years the services of NMEPM expanded from just the 2-day Marriage Encounter program to include a 1-day Marriage Encounter (SOME), Oasis for just inmates (married and single) and a Marriage Encounter for staff. All programs for inmates have handouts in Spanish as well as English. NMEPM also responded to the need to help married couples by publishing the book, The Inmates Marriage Encounter (TIME) By Mail, by launching this website, and by offering many other resources by mail. The newly revised and enlarged edition of T.I.M.E. By Mail has 25 pages of new material, and is now for engaged couples also. As you know, keeping up the morale of your inmates is very important but not always easy. We offer some simple ideas to help you. Here’s an example: Invite your residents to stay for a few minutes after Services. Then ask a question like: “How co you make Easter “special”? Then let the inmates answer, sharing ideas with each other. National Marriage Encounter Prison Ministry, Inc. is a non-profit, tax-exempt, non-denominational, charitable organization that is run completely by volunteers who donate their time and talents. NMEPM strives to improve the relationships of married inmates and their spouses, and thereby benefit them, their families, and society as a whole. The same Marriage Encounter (ME) program that saved the marriages of countless couples presented by the ME teams is now available to chaplains because of our DVD pack. The basic rhythm: PRESENTATION (now on DVD), PERSONAL REFLECTION, and COUPLE DIALOGUE remains the same. HOW DOES M.E. WORK BEHIND THE WALLS? For two days, couples meet in the chapel or large room inside the prison with other married couples under the guidance of the chaplain or the chaplain’s assignee, to experience communication on a deeply personal level. Couples work privately, learning to appreciate themselves as individuals, to accept each other in a way that rekindles their love relationship, to examine their relationship with God, and to set goals for the future. Couples eat meals together. However, non-residents leave at night. This is an abbreviated version of the Marriage Encounter that provides the high spots and gives the couples “tools” to use in improving their relationship using key DVD presentations. Sampling Of Marriage Encounter (SOME) is designed to meet the time constraints of the chaplain. Everything needed for the Sampling Of ME program is included with the ME DVD program. This program is for INMATES ONLY, married or single. OASIS provides a time to learn better communication skills, including (love) letter writing, a time to look inward, and a time of prayer. In just 4-5 hours the program helps inmates evaluate themselves, find the causes of some of their thoughts and actions, then shows them how to communicate in a non-threatening and loving way. They then look at their spiritual lives, set goals for the future, and end with prayer and prayer requests. IN EVERY PROGRAM HANDOUTS ARE WRITTEN IN SPANISH AS WELL AS ENGLISH. Order our products to begin today! ___ Marriage Encounter and Tasting ME Pack $478. $350. 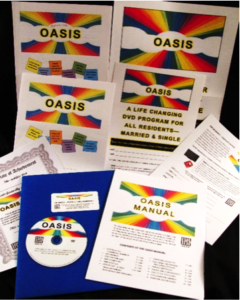 ___ OASIS Complete Pack $277. $150. ___ Both Packs $687. $400. Postage and handling is included for all orders within the USA. If you are a chaplain or other prison staff, and wish to be contacted by the Coordinating Couple of NMEPM, click here . Chaplain David Norton, FCI Jesup (GA) says, “Not only did the participating couples benefit from the Marriage Encounter program, but the other inmates were able to take some personal measure of hope and encouragement after learning about the program from the participates. I have witnessed a renewed interest by other inmates in their own families and home-lives after the good works of the Marriage Encounter spread throughout the institution.